Another day, another draw, but if you look beyond the headlines it was still an intriguing battle. The only problem was most of us don’t understand chess at anywhere near the level required to follow what was happening – which was where GM Sergey Shipov stepped in with a free masterclass. Sergey Shipov’s commentary in the original Russian can be found here at Crestbook, where you can also play through all the moves and analysis. Good day, dear spectators. This is Grandmaster Sergey Shipov bringing you the fourth game of the Candidates Final in Kazan. We’re into the finishing straight! The players have got less and less energy, but the cost of any mistake is getting higher and higher. I’m sure Gelfand doesn’t have a burning desire to transfer the battle to the tie-breaks. Grischuk plays phenomenally in rapid chess and particularly in blitz. We knew about that before, but in Kazan the Muscovite has enhanced his reputation with victories against the favourites – precisely in quick and super-quick chess. 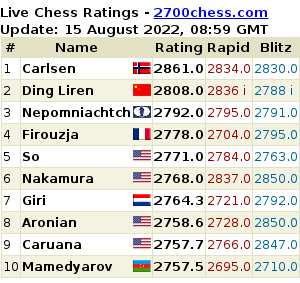 Consequently, the experienced Israeli grandmaster’s best chance of success is in the classical games. He’s going to have two attempts with White, and we can expect a serious onslaught from Boris and his General Staff. In the last game as Black they exploded a powerful bomb in the opening. It’s likely today they’ll also bring something explosive to the struggle… Our people in Kazan have informed us that today’s game is going to start half an hour later than usual, at 15:30. The reason for the delay isn’t yet known. (Translator’s note: Arbiter Alex McFarlane noted at the English Chess Forum – “The start of today’s game has been delayed 30 minutes due to another function in the hotel.”) So let’s wait. 1. Nf3 They’ve begun! 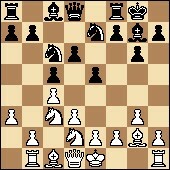 1…c5 2. c4 Nc6 The picture’s the same one we’ve seen before – the English Opening. 3. Nc3 e5 4. g3 Boris is repeating the second game – clearly he’s thought up an improvement. And here it is. A modest and reliable developing move, known about for a long time but new for this match. 6…Nge7 A routine manoeuvre. 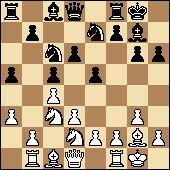 On e7 the knight doesn’t restrict the f7-pawn from putting up a fight and is protected against the Bc1-g5 attack. 7. a3 As was to be expected, Boris is trying to save on castling. He’s nevertheless intending to play the b2-b4 push, even if not as soon as happened in the second game of the match. It’s probably worth considering the h2-h4 push as well if Black castles short. 7…d6 Sasha maintains the king in the centre on pure instinct, making an obviously useful move. 8. Nd2 Another cunning manoeuvre. 8…0-0 There are now no longer any fears about the safety of the king on the kingside. A positional threat has been created. As usual, Sasha is getting a long way behind in terms of time: 1:55 – 1:17. He’s understood the advantage of the king delaying on e1. 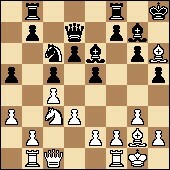 White gets the opportunity to save an important tempo with the manoeuvre Nd2-f1-e3-d5. And only then 0-0. It turns out that in the normal move order with early castling the white knight would have stepped on the f1-rook (as in backgammon) and continued its path to the centre – breaking the laws of chess. It seems as though Black has to think up some active counterplay – and it would be desirable to start it at the moment when White’s roving knight ends up on f1… I’ve got one constructive suggestion for Black: not to play a7-a5 at all. There’s the counter idea of 9…a6!? and on 10. b4 you play 10…cxb4 11. axb4 b5!. The pawn sac promises Black good counterplay. The same blow follows with even more justification after 10. Nf1. 9…h6 A surprise! A novelty. It seems as though Grischuk is constructing a simple tactical trap for his opponent. If 10. b4 there would follow the reply 10…e4! with the idea of 11. Ncxe4 f5! – and it’s precisely here that it’s important that the g5-square isn’t available to White. At the same time Sasha is intending to expand on the kingside – in future. 10. 0-0 A modest, restrained decision. It seems as though Gelfand considers he’s got a favourable version of the main line, in which Black isn’t in any way obliged to play an early h7-h6. On the other hand, White has also carried about the Nf3-d2 manoeuvre, which is also in no way obligatory. Sometimes the f3-knight would be left untouched, or sometimes it would follow the path f3-e1-c2, supporting the b2-b4 break and hoping to break through via e3 to d5. Returning to the bosom of theory. We’ve simply seen a non-standard move order. The time used is gradually equalising: 1:16 – 1:01. I can state that the novelty effect didn’t bring Gelfand a clear edge. For now. 11. 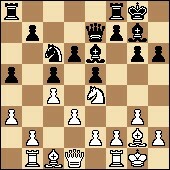 Nd5 A logical means of exploiting the position of the knight on d2. After an exchange on d5 it’ll have access to the wonderful c4-square. 11…Be6 A normal move that was asking to be played. But it doesn’t give Black a completely comfortable position. And here’s the final novelty. The white knight is heading to c3 to replace its fallen comrade. Control over the d5-point is paramount. 13…Kh8 Useful and very cunning prophylaxis. 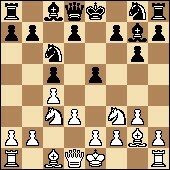 The king gets off all the white diagonals, and in such a way that in some lines the e4-knight can’t jump with check. 14. Nc3 High time. Black was already intending to play d6-d5. 14…Qd7 Prophylaxis without any clear active ideas. I’m not convinced that the exchange of bishops on h3 (or g2) is dangerous for White. It’s more likely to be the opposite, as after all the light squares in Black’s camp are very weak. At the given moment the bishop on e6 is the only one who’s defending them. It seems that with the move in the game Grischuk is preparing the manoeuvre Nc6-e7, doubling control over the d5-point. For now the clocks don’t provoke any concern: 1:06 – 0:40. 15. Bd2 White’s play looks unassuming, but it’s venomous. The positional threat of b2-b4 remains, and breakthroughs in the centre by Black are premature. A pawn storm by Black on the kingside won’t bring him anything for now except the formation of new weaknesses. The b7-pawn will never again be left undefended. And if the white knight deserts c3 for d5, then the counterblow b7-b5 will follow. If 16. Qa4, then I’ve got the suspicion that there’ll be the exchange attack 16…Nd4. 16. Qc1 Indicating that the black king isn’t located as solidly on h8 as it would be on h7. The h6-pawn is under attack. If you play 16…Kh7 they you have to look at 17. Nd5, with two ideas: b2-b4 and Bd2xh6! A modest choice. Very modest! It’s unlikely the exchange of dark-squared bishops will be in any way dangerous for Black. 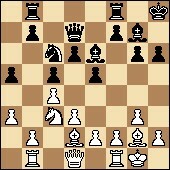 The c5-d6-e5 pawn skeleton actually provokes a desire in Black to knock the bishops off the board! 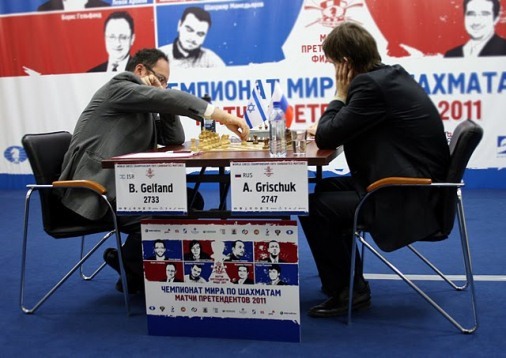 Gelfand, of course, knows best, but I don’t like the move. 17…Bh3 A symmetrical response. If you’re going to exchange, then do it en masse! The centre of gravity of the struggle is switching to the kingside, where Black’s chances are no less. 18. Re1 All the bishops remain under attack and neither of the players wants to be the first to exchange. It really is fraught with danger to allow a queen to h6 or h3. And improving the position of your enemy’s king with exchanges on g7 or g2 means helping them to attack on the kingside. With the move in the game Gelfand is preparing to retreat his bishop to h1. And offered a DRAW! Which was accepted. Well, Grischuk got off with a small fright. In the opening he came up against certain difficulties, but managed to resolve them and survive. The score in the match is equal: 2-2. 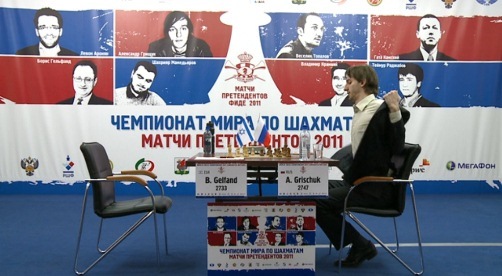 All that’s left for me, Grandmaster Sergey Shipov, is to bid you farewell, dear spectators. Until tomorrow. Perhaps the game only brought joy to a few specialists who understood some of the nuances, while in general I think an enormous army of fans was disappointed. There’s nothing you can do about it, however. There’s a great deal at stake and at a certain point the players preferred not to take risks. 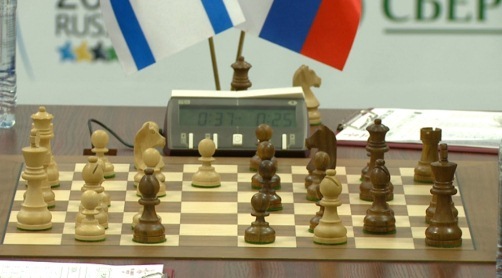 There were few significant changes from the analysis in the commentary above, but Shipov recommended 8. Rb1 (05:00 in the video) as an improvement over the game. After forcing 8…a5 he felt White would be able to carry out the planned knight manoeuvre via f1 which didn’t quite materialise in the game. Shipov stood by his suggestion that 9…a6!? was an option (07:45 in the video), but admitted it would have been “almost impossible” to play at the board. Grischuk’s 9…h6! was instead an ideal move (in the press conference Grischuk said it looks idiotic at first sight, but then explained the same justification given by Shipov). White could actually ignore the threat and play 10. b4 in any case, but it becomes almost too complex to play without preparation (Shipov was surprised Gelfand’s team hadn’t looked at the move at home). The last significant suggestion is 16. Qa4!? instead of 16. Qc1?! (19:20 in the video) as 16…Nd4 doesn’t appear to equalise fully. The way the game developed Shipov felt Grischuk was on the verge of getting an edge, with prospects of an attack on the h and f-files – in fact Shipov suggested it was even “possible to blunder” Bxh6 by playing 16…Kh7?! (21:08 in the video). The loss of the pawn opens up an avenue of attack. At the end Shipov felt Gelfand offered a draw at just the right moment, as Black might have got an edge in another couple of moves. Incidently, that contradicts the players in the press conference. Gelfand said it would no longer be chess to play on in such a drawn position, and Grischuk, when asked if it wouldn’t have been worth playing on in the hope his opponent blundered when short of time, said that you could hold White’s position with 15 seconds a move. This is getting boring, man. there’s no getting, it already is. You gyus obviously didnt read the comments , but have just counted the moves , and noted the result. The game is full of fine tactical and strategical ideas , and the ending position is dead draw in the oppinnion of both GMs, as quoted here. colin, one small suggestion: the pre-live-game post on the homepage is very useful as we’ve discussed many times before; but it has one drawback – i tend to forget to read the post-game comments which are updated much later. Maybe you could adopt a chessVibes-style summary with “IN-progress” and “Full Story” in bold at the end? ?